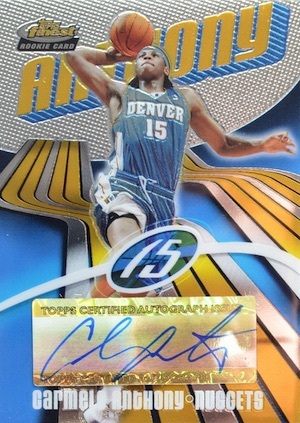 With a bold design and low-numbered Refractor parallels, 2003-04 Topps Finest Basketball is a popular option for collectors. This is even more the case due to the strong rookie class led by LeBron James, Dwyane Wade and Carmelo Anthony. 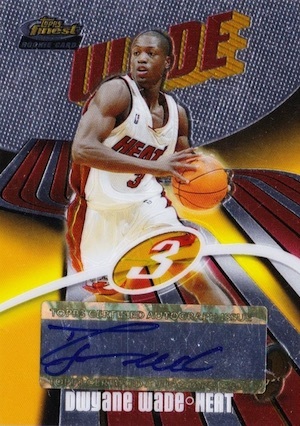 Although James' rookie is not signed, the rookie cards for Wade and Anthony feature autographs. At face value, 03-04 Finest Basketball seems like a very simple release, especially among modern cards, given that there are no inserts and the full base set sits at 185 cards. However, there is some complexity and variety to the release thanks to the subsets and Refractor parallels. The design remains consistent throughout the set, with a large last name display set against a silver orb and a background graphic that resembles team-colored roads. The player's number is highlighted in a circle at the bottom, above the name and team. While the full set is actually 185 cards, it can be easily broken down into several groups. The main base set includes the first 100 cards and features the veteran options. Next comes the veteran jersey cards that are mostly numbered to 999. They include small swatches of player-worn and game-worn uniform pieces incorporated into the base design. 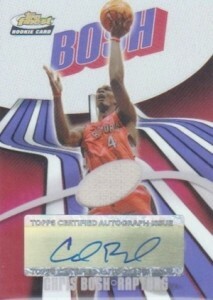 Following the memorabilia cards, 42 rookies are featured and many of the cards are signed. 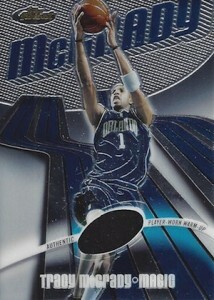 These cards are the top options in 2003-04 Topps Finest Basketball. Each numbered to 999, many also feature a sticker autograph. 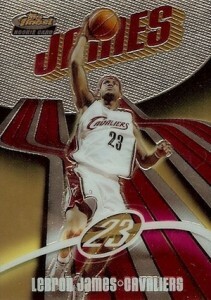 Although the rookie card for LeBron James is one of the unsigned exceptions, values are still strong his rookie. The set is finished with 13 redemption cards for biggest names heading into the 2004 NBA Draft. 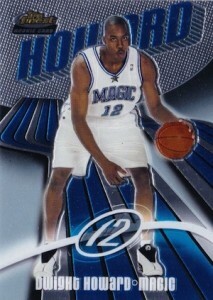 This includes pre-rookie cards for Dwight Howard and Andre Iguodala on the 03-04 Finest base design. In addition to the individual groups, each subset in 2003-04 Topps Finest Basketball also includes several Refractor parallels. The base Refractors, numbered to 250, are a little different as they add jersey pieces to roughly half the set. There are also Gold Refractors (#/25), X-Fractors (1/1) and Printing Plates (1/1). Similar to the pre-rookie cards for the 2004-05 draftees, it is important to note that there are pre-rookie cards for the top 2003-04 rookies, including LeBron James, Dwyane Wade, Carmelo Anthony and Chris Bosh. 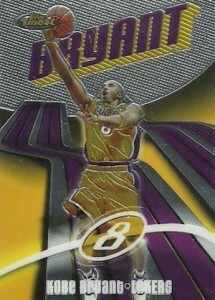 These base cards were originally issued as redemptions in 2002-03 Finest Basketball. 2003-04 Topps Finest Basketball boxes are not impossible to find, but the supply is dwindling and prices are on the higher side. Each Hobby box includes three mini boxes and each mini box contains six packs. Autographs and relics combine to average one per mini box and three per full box. 30 cards. Serial numbered #/999 or as noted. 42 cards. Serial numbered #/999. Some cards are autographed and are noted below. 13 cards. 1:4 mini boxes. 184 cards. Serial numbered #/250.